We were very fortunate to have Natalie design our family room. It was a room in the house that never felt or looked quite right. 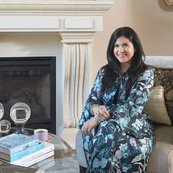 Natalie's custom design expertise transformed our family room. Her custom drapes, furniture and rug transformed our family room to our most loved room in the house! It was no surprise then when we hired Natalie to design our custom powder room and the magic continued. Thank you Natalie and we look forward to more projects with you!